KIEV, Ukraine -- International monitors moved gingerly Saturday through fields reeking of the decomposing corpses that fell from a Malaysian airliner shot down over rebel-held eastern Ukraine, trying to secure the sprawling site in hopes that a credible investigation can be conducted. College students gather around candles forming the shape of an airplane at a university in Yangzhou, Jiangsu province on July 19, 2014. 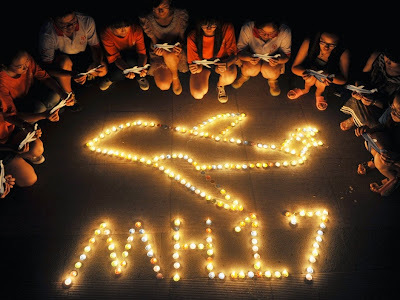 Families grieve loss of loved ones aboard Flight MH17, political leaders and people worldwide offer their condolences. But before inspectors ever reach the scene, doubts arose about whether evidence was being compromised. The Ukrainian government and separatist rebels accuse each other of firing a surface-to-air missile at the Boeing 777 with almost 300 people aboard. Many see the hand of Russia, either for its suspected support of the insurgents or perhaps for firing the missile itself. The government in Kiev said militiamen had removed 38 bodies from the crash site near the Russian border and taken them to the rebel-held city of Donetsk. It said the remains were transported with help from specialists with distinct Russian accents. The rebels are also "seeking large transports to carry away plane fragments to Russia," the Ukrainian government said Saturday. In Donetsk, separatist leader Alexander Borodai denied that any bodies had been transferred or that the rebels had in any way interfered with the work of observers. He said he encouraged the involvement of the international community in assisting with the cleanup before the bodies deteriorate further. The biggest challenge for investigators will be the preservation of wreckage evidence, said former aviation accident investigator Shawn Pruchnicki. "If they get ahold of the part of the wreckage where the missile struck that will send them a significant distance into being able to determine what kind of missile took down the plane," Pruchnicki told CBC News. "They are going to need chemical residue from the explosive warhead combined with radar traces of the missile. But there is just unbelievable contamination of this scene." In Washington, the U.S. State Department said it was deeply concerned that the separatists' had refused to allow monitors safe and unfettered access to the crash site. A spokeswoman said the site was not secured and noted multiple reports about bodies being removed, debris taken away, and potential evidence tampered with. "This is unacceptable and an affront to all those who lost loved ones and to the dignity the victims deserve," spokeswoman Jen Psaki said in a statement. "It is critical that there be a full, credible, and unimpeded international investigation as quickly as possible." Ukraine called on Moscow to insist that the pro-Russia rebels grant international experts the ability to conduct a thorough, impartial investigation into the downing of the plane, echoing a demand that President Barack Obama issued a day earlier from Washington. The jet flying from Amsterdam to Kuala Lumpur carried 298 passengers and crew from 13 countries. More than half were Dutch. On Saturday, in the village of Hrabove, one body was seen still strapped into an airline seat, with bare toes peeking out under long jeans. Another body was flung face-up into a field of blue flowers. Treatment of the victims' remains, left in the open air under a hot summer sun punctuated by bursts of rain, provoked outrage and distress. "The news we got today of the bodies being dragged around, of the site not being treated properly, has really created a shock in the Netherlands," Dutch Foreign Minister Frans Timmermans told the Ukrainian president in Kiev. "People are angry, are furious at what they hear." Timmermans demanded the culprits be found. An angry Dutch prime minister told reporters Saturday that he was "shocked by images of completely disrespectful behavior" of rebels picking through the wreckage and personal belongings of victims at the crash scene. Mark Rutte said he had an "extremely intense" telephone conversation with Russian President Vladimir Putin in which he urged Putin to "show the world he intends to help" in the investigation. Putin and German Chancellor Angela Merkel agreed Saturday in a phone call that an independent commission led by the International Civil Aviation Organization should be granted swift access to the crash site, according to the German government and the Kremlin. The commission should examine the circumstances of the crash and recover the victims, German government spokesman Georg Streiter said. Russia has "a key role to play" through its influence on the separatists, "and the world's eyes will be on Russia to see that she delivers on her obligations," British Foreign Secretary Philip Hammond said. In the Netherlands, forensic teams fanned out across the country Saturday to collect material, including DNA samples, which will help identify the remains of the 192 Dutch victims. The location of the black boxes remains a mystery, and the separatist leadership insisted Saturday that it had not located them. The Organization for Security and Co-operation in Europe's monitoring mission in Ukraine, which has a 24-member delegation that was given limited access to the crash site, said it too had received no information on the boxes' whereabouts, according to a spokesman. The operation of Flight 17 does not appear to be an issue, he said. The boxes will, however, provide insight on where the missile struck on the aircraft if that is what took it down, Pruchnicki said. "If it hit the engines first or if it struck the body and there was catastrophic breakup. This event sequence will help us understand what type of missile it was — heat-seeking versus a radar lock," he said. At an emergency meeting of the U.N. Security Council on Friday, the U.S. pointed blame at the separatists, saying Washington believes the jetliner was probably downed by an SA-11 missile and "we cannot rule out technical assistance from Russian personnel." According to U.S. officials, American intelligence analysts are still going over data to determine more precisely who fired the missile and where the attackers got the SA-11 surface-to-air system. Analysts would likely be reviewing sensor and radar data and possibly satellite imagery from around the time of the strike, as well as from previous days. Although both Russian and Ukraine have the systems in their weapons inventory, U.S. officials have said they do not believe the Ukrainian government had any of the SA-11s in that region. Instead, analysts are looking more closely at whether Russian backers gave the missile launcher to the separatists and moved it across the border into Ukraine, or if this was something captured by rebels from the Ukrainian military. Malaysia Airlines, meanwhile, said Saturday it has no immediate plans to fly victims' relatives to the crash site in Ukraine because of security concerns. A spokesman for the airline says next of kin are being cared for in Amsterdam while a team from the carrier, including security officials, was in Ukraine assessing the situation. In the Netherlands, travellers flying out of Amsterdam's Schiphol Airport laid flowers and signed a condolence book Saturday before boarding their flights, including those on the latest Malaysia Airlines Flight 17 to Kuala Lumpur.